At the end of the first quarter, most students had three blog posts published. We were ready to start with commenting on each others’ posts. I saw a peer editing activity shared by “The Daring English Teacher”, who I follow on Facebook. 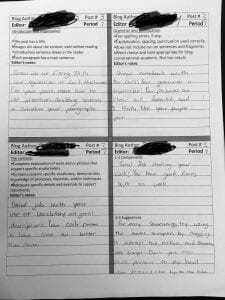 The lesson used stations and asked students to evaluate each paper with a specific focus. Because the work to be read was online and the computers require individuals to log in, I created a handout with four tasks each assigned to a different student’s blog. Two tasks focused on ELA elements; organization and topic sentences, and conventions of grammar, punctuation, and spelling. The other two tasks focused on ceramics, knowledgeable descriptions of processes and materials, accurate use of ceramic specific vocabulary, as well as the development and exploration in their work. The activity was successful because each student examined multiple students’ blogs and was able to focus specifically on different criteria while reading each post. After collecting the work and allowing absent students a chance to complete the activity, I cut up the pages and returned the comments to the original blog authors. I asked them to glue the “artifacts” into their notebooks. I created a Padlet page for each class and asked each student to give feedback on the feedback by commenting in at least one of four categories: benefits from reading as an editor, sharing a helpful piece of feedback, sharing a piece of feedback that was hard not to take the wrong way, personal goals for the next blog post. The embedded file is the fourth-period class’s example. The closing activity gave students a moment to consider how they will use what they learned as they go forward with their blog in the second quarter. Also, they will start commenting on each other’s blogs through the platform so for the last step of the peer editing activity, they shared their comments and/or suggestions on the student’s post through the blogging platform. Students who had hurt feelings over some comments or suggestions were given a chance to vent. I am hopeful that all students will read their response and be thoughtful and constructive in their future peer mentoring activities. Copyright © 2019 SCHS Open Studio. Powered by WordPress and Chun.